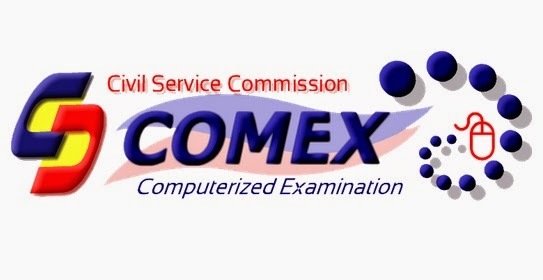 Manila, Philippines - The Civil Service Commission (CSC) announced today the conduct of civil service exam in June 2014 through the new computerized system called COMEX. The CSC Computerized Examination System (COMEX) was developed to unite all previous stand-alone examination processes into a single, automated test system. The CSC Central Office will administer the COMEX on June 3, 10, 17, and 24, slot reservations scheduled on May 28, June 4, 11, and 18, respectively. On the other hand, selected regional testing centers will hold the exams on June 5, 19, and 26, with reservation dates on May 30, June 13, and 20, respectively. COMEX is available at the following regional testing centers: Regions 1 (San Fernando City), 2 (Tuguegarao City), 4 (Panay Ave., Quezon City), 5 (Legazpi City), 7 (Cebu City), 10 (Cagayan de Oro City), 11 (Davao City), and Cordillera Administrative Region (Baguio City). Testing centers in the other regions will open within the year. An applicant may only reserve a slot on the scheduled reservation date of his or her preferred exam date. He or she must not have taken the same level of exam within the last three months. Application through COMEX is easy. First, the applicant shall create a user account in the COMEX website. The applicant may then pick an exam program from the online offerings. A list of exam schedules with the types of exam, number of slots, date, time, and venue of personal appearance and examination may be viewed. The applicant shall receive an email confirming the slot reservation. Once slot is confirmed, applicant makes his or her personal appearance at the CSC COMEX testing center to verify his or her identity, pay the exam fee of PHP600, and have his or her photo, biometrics, and digital signature captured. Applicant is then ushered to the computer room where he or she would take the test. The Career Service Examination is a general ability test that lasts 3 hours for the Professional level and 2.5 hours for the Subprofessional level. June 2014 COMEX (exam) results shall be released within two weeks after the date of examination. For further queries, contact the CSC COMEX Administrator at telephone numbers: (02) 931-8163, (02) 931-7935 and local 712, 714, and 716.